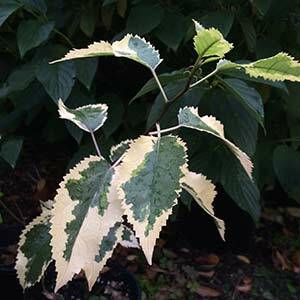 Hoheria populnea ‘Alba Variegata’ is perhaps the best known of this group of evergreen shrubs from New Zealand. All Hoheria species have the common name of ‘Lacebark’. 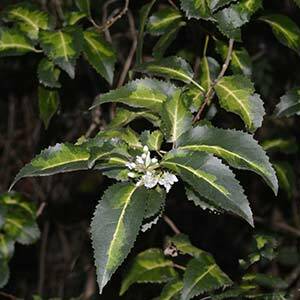 This is an evergreen that has scented flowers from summer to autumn, this a fast growing small tree that will reach around 10m in height. With a naturally bushy habit it makes a good specimen tree, and can also be used as a flowering screening or privacy plant. This is a plant that has a good growth habit in light shade which adds to its usefulness as a landscaping plant. Easy to prune shape as required. Best pruned in spring as new growth commences. Hoheria make excellent screening plants as well as feature trees. The darker foliaged varieties can be excellent background plants in the garden border. Useful for attracting birds and butterflies to the garden. It is best to mulch around Hoheria in summer to help maintain a cool moist root run. Height – To around 8 metres depending on variety, soil and climate. Spread – To around 5 metres. Soil -Humus rich, well drained. Drought tolerance – Once established they are a reasonably drought tolerant plant if given a cool root run. Foliage – Glossy and toothed. Flowers – White with a slight perfume. H. populnea ‘Alba Variegata’ – Excellent variegated foliage with small white flowers in autumn. Green leaves edged with white. H. populnea ‘Aureovariegatea’ – Deep green leaves with yellow variegation. H. augustifolia is the narrow leafed lacebark smaller growing to around 5m. H. sexstylosa comes in a purple leafed form, reaches around 6 – 7 m in height depending on conditions.